This heavy duty stand is at the top of its game with triple security with KBS key block system, safety friction brake, a protected Manual winch. Making it easy to move are 8 castors for vertical & horizontal movement. With each leg able to adjust in height and leg braces it makes it suitable for use on slopes and steps and very stable using a metal base. The Apltek 6500 has a mast top to attach security cables to. 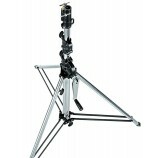 Manfrotto 083NW Wind Up Stand w/Levelling Leg. Chrome steel stand with geared column. Elevation: 2.2 cm per handle turn. 1 levelling leg. Wind Up Stands - Manfrotto's tall, high-load wind-up stands with fold-away crank handles, levelling legs, double braces, internal safety cables and simultaneous risers are industry leaders. Manfrotto Heavy Duty Lighting Stands - A range of heavyweight Wind-up studio stands, some with wheels, for the support of heavy lights, backgrounds etc. The Manfrotto Group is a world leader in the design and manufacture of photographic and video camera supports, lighting supports and suspension equipment for professional photography, video, broadcast and cinematography. Manfrotto Lighting Supports & Accessories - we are happy to offer a selection of Manfrotto's high quality Studio and Lighting Supports, as well as accessories for use in and out of the professional photographic studio. We keep most of these items in stock, and are able to offer heavily discounted prices on our most popular Manfrotto products. Please Note: Depending on what we have in stock, some items listed may be badged as ARRI but all are made in the same Manfrotto factory in Italy and have the same specifications. 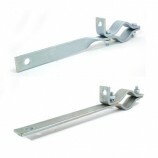 The Tank Trap provides the means to support a vertical Tube or Scaffold Pole to fly luminaires etc. Ideal for side lighting. 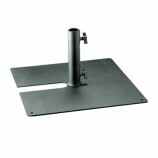 A Tank Trap consists of a 600mm (2ft) square steel plate, with 50 mm (2”) receiver. Wing knobs grips 48 - 51mm aluminium or scaffold poles. There is a cut out in the base to allow compact stacking for transport and storage.